This was one of the most interesting places I have ever visited! 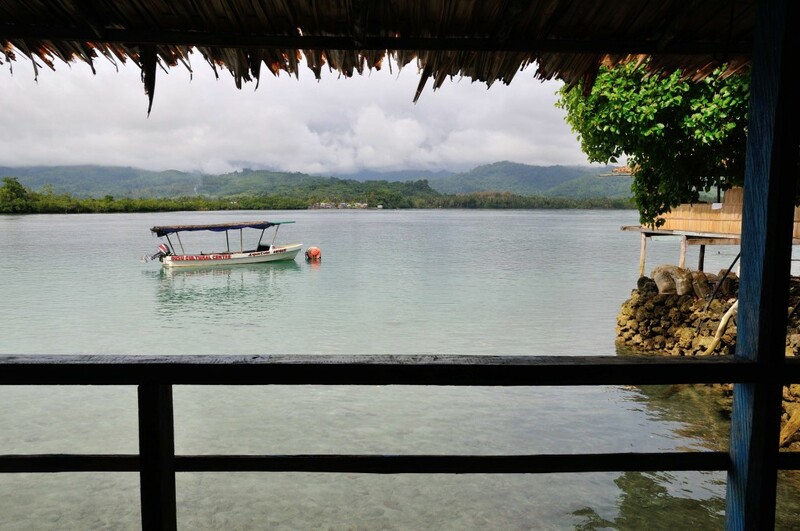 It is called Langa Langa Lagoon on Malaita in the Solomon Islands. We arrived on Busu Island in Langa Langa Lagoon after a lovely 45 minute boat ride – many people waved to us when they saw Shane and me in the boat. 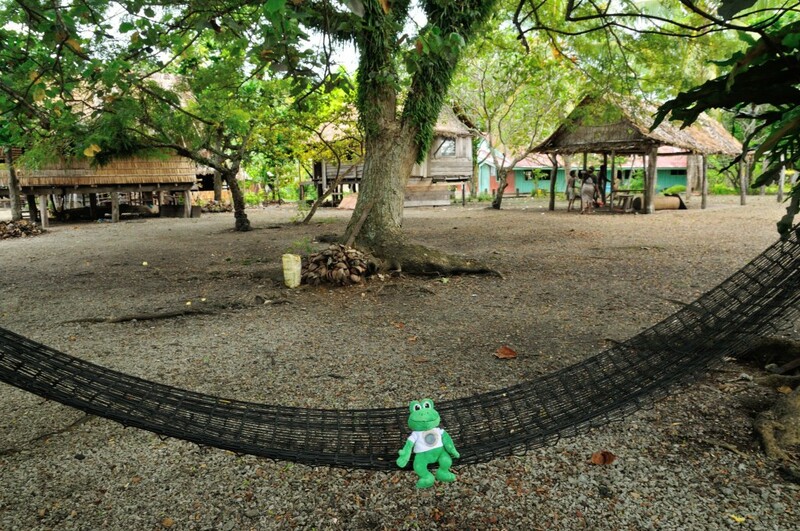 Busu Island is home to the Baekwa people, and 400 of them live there in wooden buildings. The island is artificial and is built on coral. The dead coral was hard on my feet and it was not comfortable to hop around, so Shane carried me. Langa Langa lagoon is very beautiful and there were lots of places for me to swim. 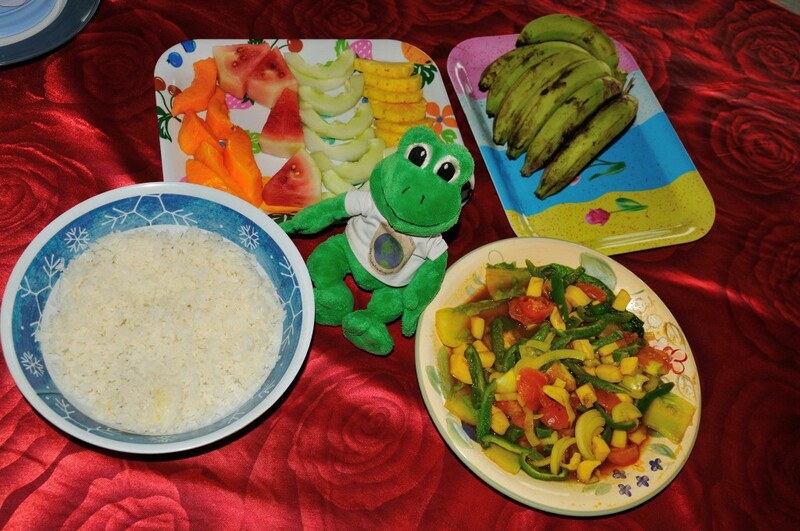 We first ate lunch and it was seafood, vegetables, rice and tropical fruits. It was very tasty! While Shane was eating, I looked at some of the very large shells – I could have crawled inside of one because it was so big! Polly looks inside a large shell! The Baekwa people still worship sea animals as totems including the octopus and stingray, but their favourite is the shark. The shark is very important to them, and they offer sacrifices of a cooked pig to sharks to protect them from other wild sharks when diving for shells and to protect them during long and dangerous sea journeys. Christianity has also arrived on the island and there is one church. I was very happy to see that the people here have a strong connection with nature. The people did not own many things, but they were happier than most people I see in modern cities. Langa Langa Lagoon is famous for the making of shell money, and Shane told me that it is used for sale, barter, and gifts. 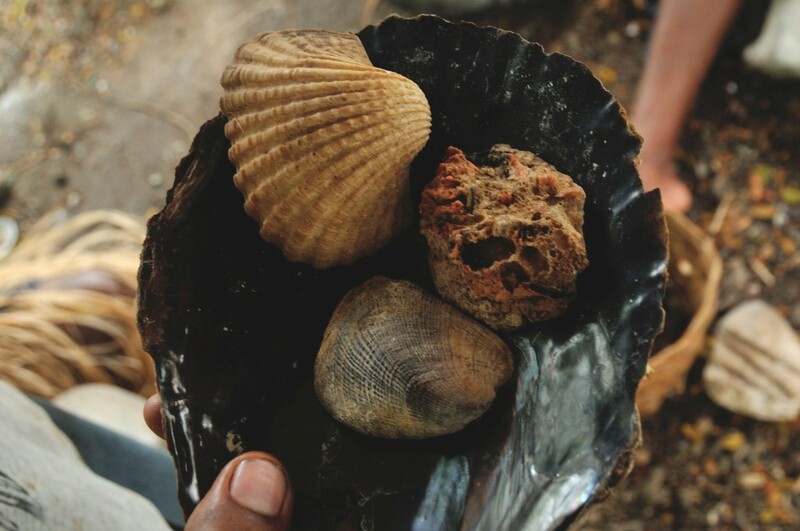 Shells used to make money: White shell is called Kakadu; red shell is Ronu, brown shell is Kee and black shell is Kunda. 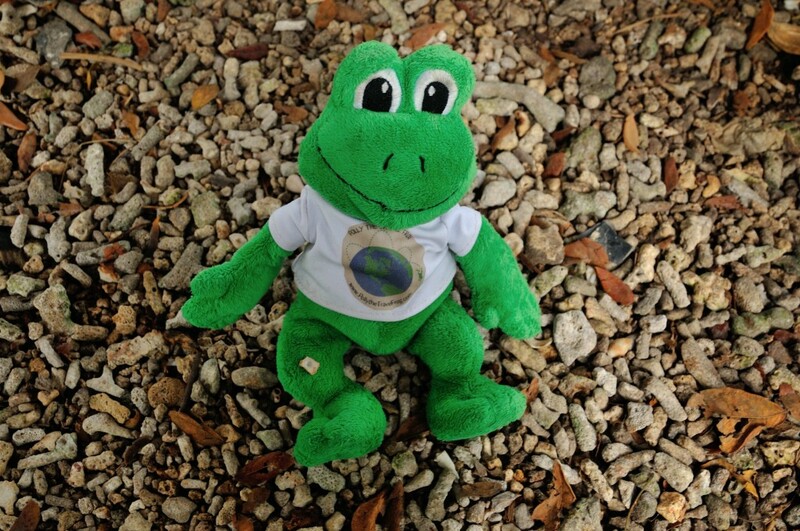 While we were visiting, the people made shell money and I helped them! The first step is to crack or grind the shells into small pieces. I helped carry shells from a basket. After the shell is broken, a hole is drilled into each piece, but it takes a long time – an hour to drill just one hole! 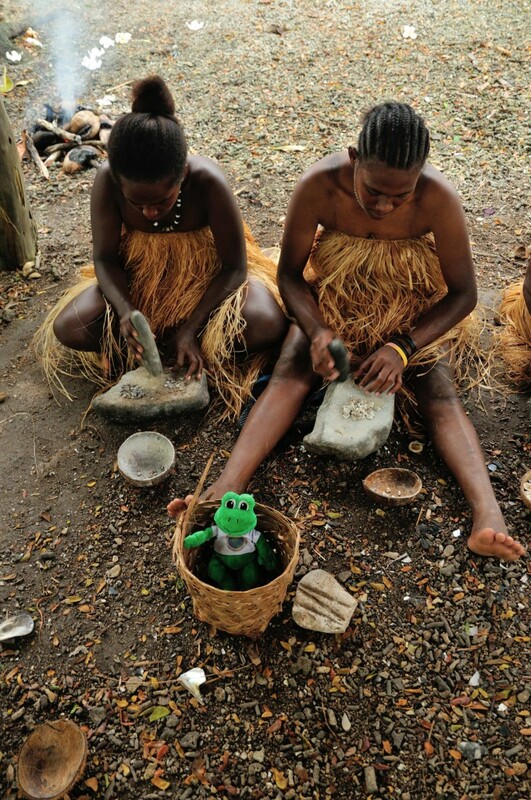 Polly sits on the artificial coral Busu Island with a piece of shell money on her leg - the hole is still being drilled into this piece. Sometimes a shell is heated and it changes colour – from brown into pink. 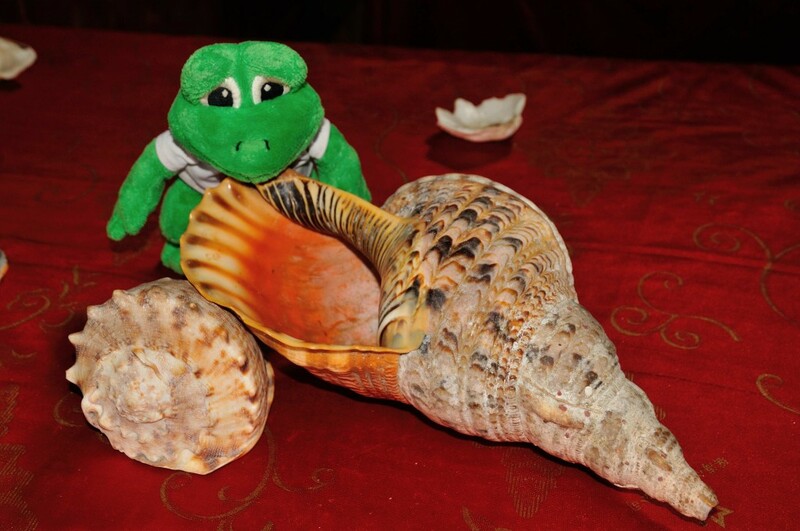 The hardest work is to smooth a string a shells into round discs, and it takes two men two days to finish this task – I tried to help, but it was too hard for my froggy arms! Smoothing the shells is hard work! 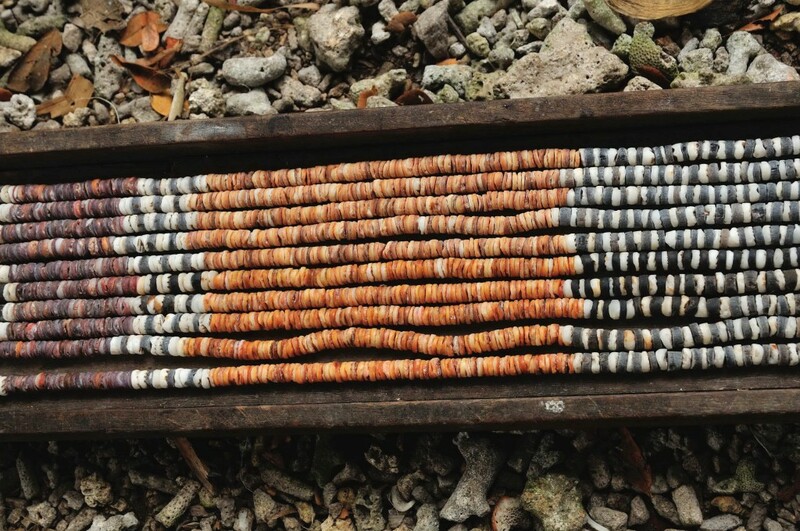 When it is finished, they string the shell money together – it is very beautiful! The shells are used to decorate the clothing of a bride for her wedding. Shane told me that a bride will carry a coconut as it is a sign of fertility. I was very sad to finish my visit to Busu Island, and when we sat in the boat to leave, many people came and waved goodbye. 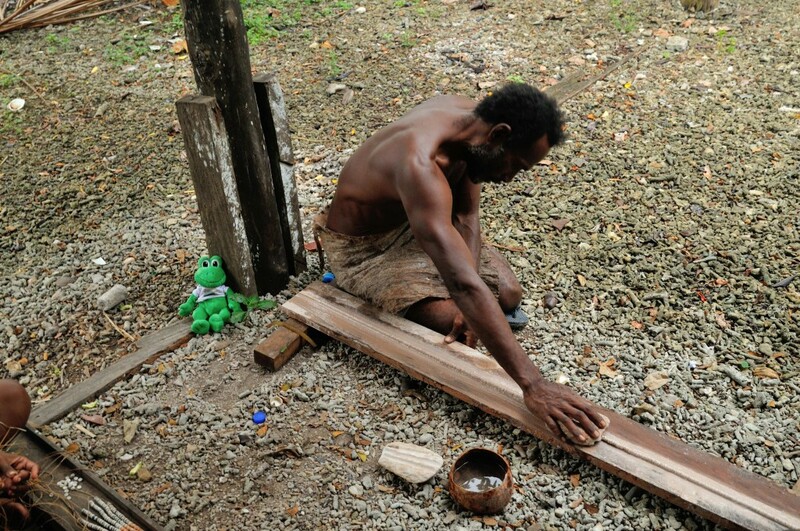 The Baekwa people of Busu Island were kind and gentle and I want to visit them again one day soon! I think it would be a lot of fun to make shell money. This is another fascinating place that I would like to visit one day. The coral beaches remind me a lot of the beaches on the island of Bonaire. Great post! As usual, the food picture is making me hungry!